DISROC is a general purpose Finite Element code specially conceived for modeling media containing discontinuities like fractures, cracks, rockjoints and masonry joints, as well as linear reinforcements like rockbolts and fibers in concrete and composite materials. Disroc includes a large variety of non-linear constitutive laws and allows taking into account thermal and fluid pressure effects. DISRCAC is a FEM mesh generating tool for fractured media used as preprocessor for DISROC and POROFIS. 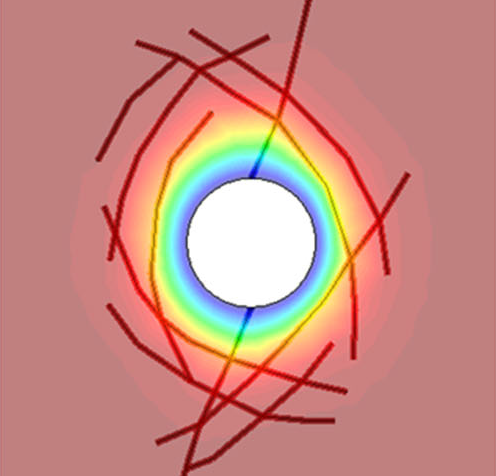 POROFIS is a code derived from Disroc and specially conceived for modeling coupled Thermo-Hydro-Mechanical and Chemical phenomena in porous fractured media. Porofis is designed for research-type applications and allows taking into account user defined coupling models and material constitutive laws. A free version of Porofis can be downloaded here. An academic licence granted to the Penn State University. See here other universities and research institutes using Disroc. 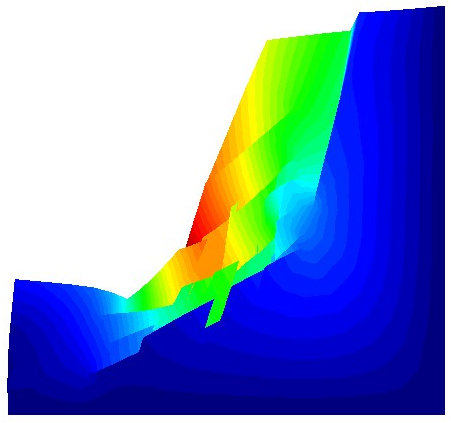 The Shear Strength Reduction Method developed for calculation of the Safety Factor of geotechnical projects. See here.